Get the latest news and special offers for Nightingale’s Pantry on Facebook! Check out our most recent Facebook posts, specials, soup of the day, pictures, and fan interactions with Nightingale’s Pantry. Join us on Facebook for these things and more! One more thing — looking for a fun or last-minute gift? 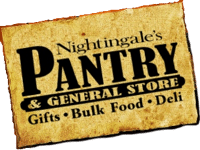 Give a Nightingale’s Pantry gift card (available in our store)! Nightingale's Pantry Nightingale's Pantry shared a post. Its Strawberry Pie Friday at Nightingale's Pantry in West Point. *disclaimer- I have no idea how many pieces are left.